Milwaukee® designed and built brushless POWERSTATE™ motor for up to 10x longer motor life and up to 60% more power. Flexible battery system: works with all Milwaukee® M18™ batteries. At only 7-3/4" length, this drill driver allows you access to the tightest work spaces. As Stated By Milwaukee On There Website-. 1.5Ah RED LITHIUM-ION BATTERIES. 2 x 18v 1.5Ah RED LITHIUM-ION BATTERIES. Fuel Next Gen is a combination of a POWERSTATE motor, REDLINK battery technology and a brushless motor. Next Gen is Fast, Stronger and Smaller with up to 60% more power. 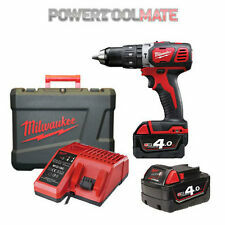 Milwaukee® designed and built brushless POWERSTATE?. 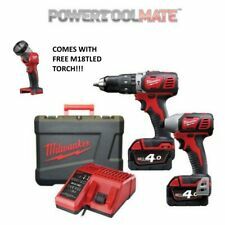 MILWAUKEE M18 CBLPP2A-402C 18v BRUSHLESS TWIN SET. In very good and clean used condition and full working order. • M18BLPD 18V Combi Drill. M18BLPD 18V Combi Drill • M18BLID 18V Impact Driver. • 2 x 4.0Ah 18V red Li-Ion battery. M18BLID 18V Impact Driver • M12TLED 12V Torch. M12TLED 12V Torch • Sealed aluminium 90° rotating head. The M18BPD uses Li-ion batteries, superior to their NiMH counterparts. 1 x M18FMTIWF12. Flexible battery system: works with all Milwaukee® M18™ batteries. Milwaukee® designed and built brushless POWERSTATE™ motor for up to 10x longer motor life and up to 60% more power. M18 FUEL™ PERCUSSION DRILL. Blow Energy5.1 ft-lbs. Solid Bit Capacity1-9/16". Weight12.15 lbs. 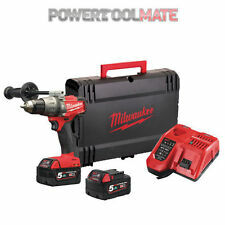 Milwaukee M18 FPD2 Features Milwaukee M18 FID2 Features M18 FPD2 Specification M18 FID2 Specification Flexible battery system: works with all Milwaukee® M18™ batteries. Milwaukee® designed and built brushless POWERSTATE™ motor for heavy application under load. Milwaukee® designed and built brushless POWERSTATE™ motor for heavy application under load. Flexible battery system: works with all Milwaukee® M18™ batteries. 1 X MILWAUKEE HARD CASE. M18 FPD2-502X - DRILL. M18BPD Combi Drill. 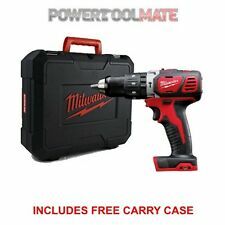 M18BPD Combi Drill Features M18BPD Combi Drill Specification Specs downloaded from Milwaukee Flexible battery system: works with all Milwaukee® M18™ batteries. No load speed gear 1 (rpm): 0 - 450. 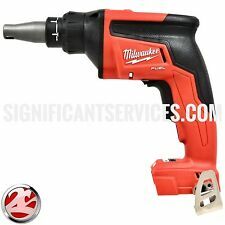 MILWAUKEE 2893-22CXP M18 LI-ION DRILL/IMPACT/HACKZALL BRAND NEW! FACTORY SEALED!